Friday morning and I am late for work! I sprint, heart racing to the station. I slide through the closing doors and as I jump on board I happen to glance down at my feet. Something seems wrong. I take a second look… I have odd shoes on!! Oh bother (Actually I said another word beginning with b but for the sake of this blog let us assume I said “bother”!). I am on the 7:46 heading to London Victoria with odd shoes on. The doors have shut and I am stuck in my black, similar, but obviously different boots. If I had an office job I guess I could have got away with this blunder by hiding my feet under the desk. Unfortunately, as a Physio my feet are on show to my patients all the time; either as I demonstrate exercises or as they lie on their tummies on my treatment couch, staring through the face hole seeing nothing but my feet. "Bother!" I mentally curse the reason why I am standing on the 7:46 in odd boots, ready for a day of humiliation. Thursday night had been spectacularly late. This morning I had overslept and got dressed in a panic. I grabbed the first shoes I could find and ran at full speed to the station. I know what you are thinking - Party season it may be, but the late night was nothing to do with going out. I had not been out on the tiles drinking, nor had I been embarrassing myself dancing the night away at the work Christmas do. I was actually riding my bike ‘til 3 am. What????!!!!!! Yes, that's right, I was in my pilates studio at home, music cranked up until it made the walls shake, drinking nothing but water, spinning away on my turbo trainer ‘til the wee hours. Why??!! Well, the previous weekend Ian and Kate Potter (I have blogged about them before - from AQR (A Quality Ride coaching) had come over to spend the day with me and Simon. We spent a portion of the day talking over our goals and aspirations for next year. 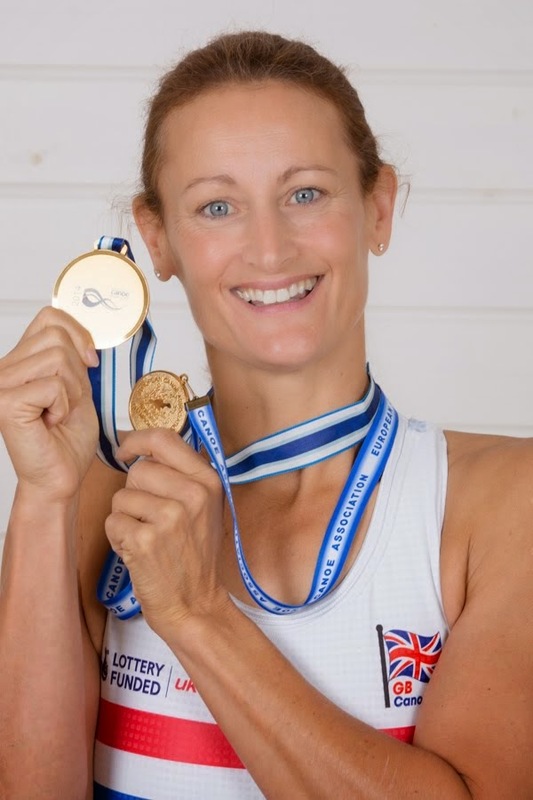 Kate is a wealth of knowledge and has tonnes of experience of all things bike racing and training. I was excited to learn that she too had just booked into Exposure 24 – The UK national 24-hour solo championships. We are both going to be racing at this event! (thankfully in different classes) and had so much to share! To compete in a solo 24-hour race you have to be a bit bonkers. To train for a 24-hour race you have to be completely insane. Kate and I had a fun time talking through the seemingly crazy training techniques we have used to prepare ourselves for 24 hours in the saddle. One thing she suggested, which initially even I thought was particularly crazy, was nocturnal turbo training. She admitted to getting on her turbo trainer and pedalling through the night to get her body, and more importantly her mind, used to 3am exercise. Eventually, as she explained the rationale, I started to see the merits of this approach. Thursday night I found myself wide-awake at just past midnight and “jiggy legged” (Is it just me who gets this?). I remembered my conversation with Kate and thought, why not jump on the bike now? Timing was perfect as Simon was in America and the kids on sleepovers – I had the house to myself and Simon would be similarly exhausted when he got back, so why not!? I actually began to get quite excited about the prospect of dusting off my collection of 1980s music (which the kids never allow me to listen to) and to spending a few hours with Bon Jovi, Duran Duran, Foreigner and Peter Gabriel reverberating round the house. By 3 am I had had enough of my solo Karaoke party. I jumped off the bike, took the rear wheel off and changed a tube. It took ages because my brain was knackered and still banging around my skull from the exceptionally loud music, but I did it, hurrah!! I showered, collapsed into bed and instantly fell into a coma. The next thing I knew the alarm was going off. I must have made myself slightly deaf, as it had been going off for a while. Oh “bother” - I was late!!! So here I am on the train in my odd shoes, aching legs, heavy head, slightly deaf, wondering how I am going to cope with the day. The day....???? I am looking at the Metro newspaper belonging to the man in front of me. Friday. Friday? Friday!!! The significance of Friday gradually sinks in. I don't work on Fridays! I remember now I had chosen Thursday night as my nocturnal training session as I knew I could lie in on Friday. I had forgotten to turn the alarm off and I was on the train for absolutely no reason. Oh double “bother”!! As the train pulled into East Croydon I stepped off and walked across the platform, hoping no one would look at my odd boots, to wait for the next train home. I was very cross that I had been such an idiot in not turning the alarm off, but had no regrets at all about staying up half the night on my bike. I really enjoyed my nocturnal turbo spin down my 'musical memory lane' – it had been a long time since I had spent a night alone with Simon Le Bon ;-) I had had no distractions. Just me, the CD player and my bike – a perfect start to my training for next season’s 24 hour races! I found myself Christmas shopping with the kids last week. Hideous experience!! The shopping centre was full of stressed people walking the wrong way, trying to think what their loved ones might want for that special gift. A perfect present that would hopefully make the recipient happy. I was struck by the number perplexed, huffing men and exhausted, brow knitted ladies with their screaming toddlers, all carrying vast numbers of over laden bags (and their screaming toddlers!). I found myself wondering, at the risk of being a little 'bah humbug', what's the point? They might be looking for a present to make their loved ones happy, but how many of those gifts would prove to be short lived, impulse purchases- soon to be forgotten after the initial excitement and pleasure of Christmas, and eventually ending up most probably as land fill. talking it through with your friends. Most purchases give pleasure at the receiving/ initial use stage and some even give pleasure for the first few outings- new shoes or a new car? But these items soon become part of your everyday world and you just expect to use them. Some purchases give pleasure during the research and the first few times you talk it over with your mates, for example a holiday. For me there is only one thing I can think of that gives pleasure in all 5 phases- from researching through buying, using and talking to mates- and that is a bicycle! Without a doubt, it is brilliant to be able to plan the purchase of a new bike. So many delicious frames and components to think about and buy. The first ride makes you grin as you find that the hours of taking advice have been worthwhile. It doesn't matter how many times you ride your bike, your pleasure ratings stay high for every ride. Not only that but when you chat to your mates about the ride you get even happier! Lots of manufacturers guarantee excellent workmanship, but how many can claim to guarantee happiness? My new bike arrived last week after months of researching. It arrived in the post and I had to negotiate pretty ferociously with the kids to let me know where they had hidden it, as we have a strict "no new things after the first of November rule" in this house! After I rode on the Cotic KP 24 at the world championships I guess it is hardly surprising that I ended up choosing another Cotic - But which one, and more importantly which colour ;-) ?.... Kelvins suggestion that "because I am a girl" I should get one in every colour, was amusing but not that helpful! 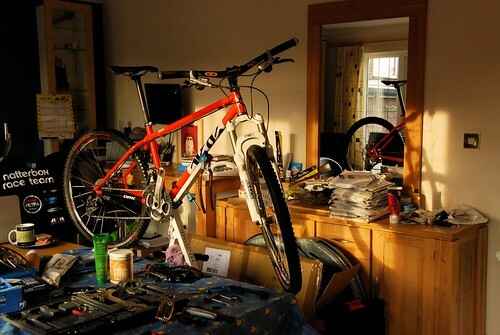 Building up my new bike in the chaos of the dining room. At last! My first ride on my new bike. There is nothing quite like riding a brand new bike for the first time. I wanted to look at it as I was going along, admiring the fantastic colour and form. (Looking down and examining every aspect of a new frame on the go is not to be recommended- pride comes before a fall 'n all that!). At one point we had to cross a stream. Not wanting to get my new bike dirty or wet I stopped, lifted it up and walked through the water. Guffaws of laughter from my riding buddies and I realised what I had done. Yes, this was a cherished new item, but the Soul was designed to be all season, all weather, all conditions - even in the snow! 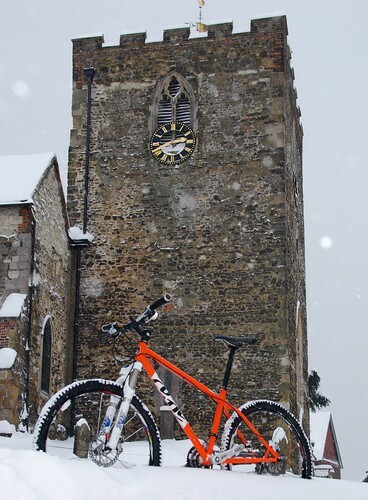 Our bit of Surrey had more snow than Wales last week, and while every one went out sledging or snow balling I went out on my bike. I stopped to chat to an 'Urban skiier' who thought it odd that I should want to plough through the snow on a bike. ("which is surely made for summer not snow?"). I chuckle to myself at the irony. I am not sure it looks totally 'normal' cross country skiing, dressed in C and A ski kit along the high street in suburban Surrey either. What does it matter, we are all having fun in the snow! But I have a slightly smug feeling inside as I cycle past the 'grown up' kids trying to go faster than their 'real' kids on the snowy hillside. 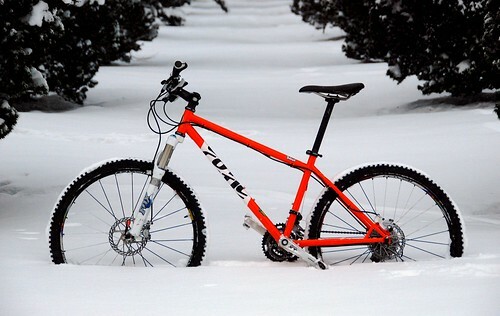 I know that when the snow melts and they put their skis, sledges and ski kit in the loft, I am still going to be riding this bike. I will be zipping along my trails with adrenaline pumping out of my ears and a wide grin on my face. My Soul- both mine and my Cotic "flying"